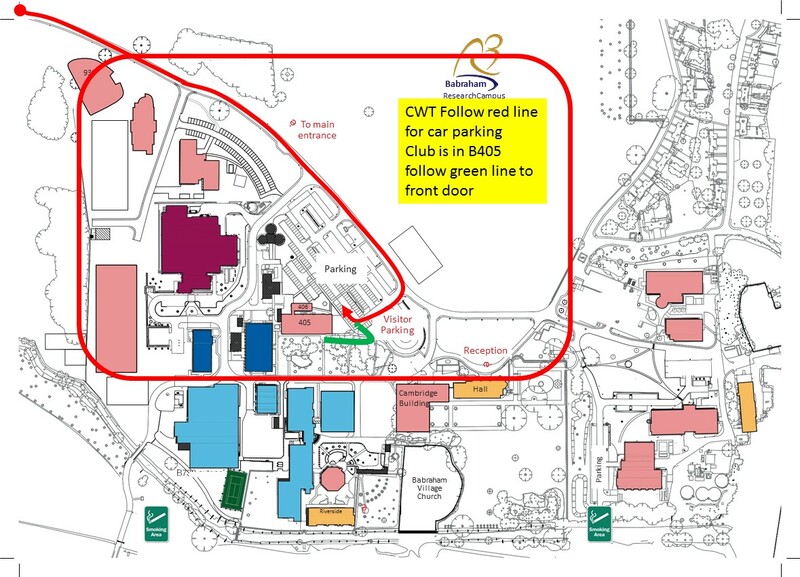 Club Meetings are in Building 405 (see map below) at the Babraham Research Campus CB22 3AT. Access to the Babraham Research Campus is from the roundabout on the A1307 and there is plenty of parking . You must let the Membership Secretary know in advance if you wish to attend as a visitor as there is strict visitor security on the site. SAT NAV Postcode is CB22 3AT. By car From the M11: Leave the M11 at junction 10. Take the A505 eastbound towards Newmarket. When it merges with the A11 northbound to Newmarket and Norwich, stay in the left-hand lane and leave at the next exit (Four Went Ways). At the roundabout, take the first exit for the A1307 to Cambridge. Disregard the first turn left signposted to Babraham Village, and continue to the next roundabout, taking the first exit signposted Babraham Research Campus. From the A1(M): Leave the A1(M) at junction 9 on the A505 to Baldock. Stay on the A505 past Royston, crossing the M11 at junction 10, then follow the directions from the M11 above. From the A14 (west): Follow the A14 eastwards until it becomes the M11 southbound at Cambridge. Stay on the M11 for another 9 miles (15km), and turn off at junction 10 (A505). Follow directions from the M11 (above). From the A14 (east): From the A14, take the A11 towards London until you reach the Fourwent Ways roundabout (the junction with the A1307 to Cambridge and Haverhill). Take the third exit for the A1307 towards Cambridge. Disregard the first turn left signposted to Babraham Village, and continue to the next roundabout, taking the first exit signposted Babraham Research Campus..
From central Cambridge: Take the A1307 signposted to Haverhill, past Addenbrooke’s Hospital. Babraham is located a further 3 miles (5km) outside of Cambridge, approximately 6 miles south east of the city centre. Turn right off the A1307 at the Babraham Research Campus roundabout, taking the second exit.